Good morning. Are you ready for something new? I would like to thank the committee for giving me the opportunity to talk about Sartre’s anarchist political philosophy and to discuss with you whether Sartre’s anarchist political philosophy could be a draft for a diverse society. The first statement is one Sartre made in an interview given to the Spanish writer Juan Goytisolo and published in the Spanish newspaper El País. The second is taken from an interview given to the Cuban philosopher Raúl Fernet-Betancourt and two of his colleagues in 1979, but published only in 82. Does still anybody of you have any doubt that Sartre considered himself an anarchist towards the end of his life? It is obvious, there has been quite a change, since Sartre had written in Search for a Method in 1957 that Marxism was the philosophy of our time and existentialism only an ideology, so to speak a second-rate philosophy. Three years later, it sounded already quite differently. In a discussion between him, Benny Lévy alias Benny Victor and Philippe Gavi, which was published two 1/9years later under the title On a raison de se révolter, Sartre said that he considered himself a member of the antihierarchical-libertarian movement. What is the meaning of libertarian, in French: libertaire? It definitely has nothing to do with Ayn Rand, Robert Nozick or Murray Rothbard. However, it is neither an innocent adjective to liberty. In French, libertaire is but a code word for anarchist. Since the infamous lois scélérates of 1893/94, most of the French anarchists call themselves libertaires. 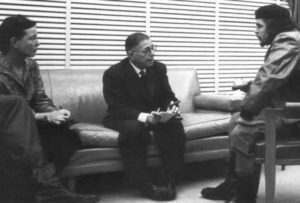 One year later (1973) when asked about his current political position by the German journal Der Spiegel, Sartre stated clearly that he was not a Marxist anymore, but considered himself a Marxian. The journalists – obviously knowing that he called himself antihierarchical-libertarian – asked Sartre whether his an anarchist now. In an act of either outright lying or of bad faith, he answered that in French libertaire does not mean anarchist. It took him another two years to conceding publicly that he had moved in direction of anarchism. When talking in two separate interviews with Contat and Rybalka in 1975—one for his 70th birthday, the other for a volume about him in the Library of Living Philosophers, published late in 1981—he agreed to describing him as a libertarian socialist and he conceded that this term was an anarchist notion. Finally, in 1978/79 he outed himself as anarchist in the two statements with which I started my presentation. Unfortunately, these statements were made in publications hardly read by Sartreans and they remained widely unknown. Some may be puzzled about Sartre’s change from Marxism to anarchism. What stands behind Sartre’s conversion from Marxism to anarchism? In my opinion, Sartre’s trial to combine existentialism and Marxism was some kind of rotten compromise. Sartre became a Marxist when the political circumstances demanded it and he quit Marxism after the political circumstances had changed. Finally, there is a deep incongruence between Marxism and existentialism. Existentialism is based on methodical individualism, just like Kant’s philosophy, Max Weber’s sociology or the philosophies of modern liberals such as Rawls, Dworkin or Habermas. On the other hand, Marxism is based on methodical holism, an approach Marxism has in common with Hegel’s philosophy, Durkheim’s sociology and the later philosophies of the structuralists and communitarians (Sandel, Taylor, MacIntyre, Walzer). To give an example to illustrate this thesis, have a closer look at the notion of the class. Marxism is talking about class society and class struggle, which implies that the classes are the agents of history. However, with Sartre, classes are only series. The agents of history are individuals and particularly groups. Whereas there is a deep incongruence between Marxism and existentialism, the combination of existentialism and anarchism was a congenial alliance. By his change of his political philosophy from a Marxist to an anarchist one, Sartre could bring his political philosophy in line with his major philosophical works, with Being and Nothingness and Critique, but also the Notebook for an Ethics. This change from Marxism to anarchism unfortunately remained quite unknown, among Sartrians as well as his critics. There are subjective and objective reasons that caused this unsatisfactory situation. Both sartrophiles and sartrophobes like to see in Sartre some kind of a Marxist. For sartrophobes it is easier to dismiss Sartre’s philosophy when they can call him a commie or a Maoist. On the other hand, many sartrophiles like the concept of a Marxist existentialism because many of them were Marxists at one point in time. Finally, there was also the opposition by his “family”—at least the older half, i.e. Beauvoir, Bost, Lanzmann, with the remarkable exception of Gorz—to this new anarchist Sartre. This opposition was not astonishing. Let us not forget that in 1974 a political rupture between Sartre and Beauvoir had taken place during the second round of the presidential elections. Whereas Sartre turned to anarchism, Beauvoir supported Mitterrand and by that became a social-democrat. For the “family” and for many Sartreans, Sartre’s new political development in the direction of anarchism was the result of the abduction of an old man. However, when we read the interviews in the order they were taken and not published, we clearly recognize a high consistency in this development. It has always been Sartre who was in the driver’s seat and not Benny Lévy. Of equal importance as the subjective reasons for the missing recognition of Sartre’s change from Marxism to anarchism are the objective ones. The availability of the texts of Sartre’s interviews is extremely poor. I have identified 24 interviews of importance for the new political philosophy Sartre developed in the 1970s. 14 of them were originally published in French, 4 in German, 2 each in English and Italian and 1 each in Spanish and Flemish. Only few of these texts were translated. For example, I could find only six translations into English. Fortunately, at last and at least a translation of On a raison de se révolter into English will be published coming year. Another issue which complicated the understanding of Sartre’s development in direction of anarchism were the long delays of up to six years between interview and publication. To get a serious understanding of the development of Sartre’s new political philosophy, it is highly advisable to read the texts according to the date of when the interview was given and not the date of its publication. From fundamental choice to a diverse society and individual rights. What is the basic principle behind Sartre’s new anarchism? The basic principle is that each individual makes his own fundamental, original choice. By his fundamental choice, the subject chooses also his values including and particularly his political values. All choices are contingent, discretionary, des actes gratuits. Which also means that each choice is a choice in its own right and that there is no criterion to differentiate between a good and a bad choice. That is what Sartre had basically stated already in Being and Nothingness. Correspondingly, Sartre identified socialism already in Materialism and Revolution and in the Notebook for an Ethics with the realization of Kant’s realm of ends. In the 1960s, in Sartre’s Marxist time, Sartre referred as definition of socialism to the Marxist equivalent of Kant’s realm of ends, to the ideal of a society where each of us receives the goods according to one’s needs. However, this later definition of an ideal society is not only a part of the Marxist definition of an ideal society, but it is a deeply anarchist definition as well. It was the common denominator of Marxists and anarchists at the time when they were united in the first International (1864-72). “To each according to one’s needs” implies a society where everyone and each of us can live according to one’s own fundamental choice. In this understanding of an ideal society, socialism has nothing to do with dictatorship of the proletariat or a planned economy in the Soviet style. The fundamental assumption behind it is rather that values and needs vary from individual to individual, that we live in a pluralistic and diverse society whose major prerequisite is individual freedom. Only in a society where each individual is free to realize his values and his needs, socialism will be realized. There is a deep contradiction between a society based on individual choice and a class society, since in a class society these are the interests of the class and not the individual interests that are decisive. Sartre recognized this in 1972/73 and correspondingly changed his concept from a class society to a society based of New Social Movements. The predecessors of such a concept of society were on the one hand André Gorz in the 1960s, on the other hand the French sociologist Alain Touraine. The later made this model of society very popular around 1970, while Bourdieu, the other prominent French sociologist, still staid with the traditional Marxist concept of a class society until his premature death in 2002. Not the classes, but the New Social Movements are the agents of change in the society and therefore of history. In particular, Sartre supported the new social movements of the feminists, the gay rights activists and the regionalists. He also supported the first ecologists—against the military camp in Larzac—and movements against racism and for prison reform. The most important texts in this regard are On a raison de se révolter, particularly with his arguments against Benny Lévy’s Maoist melting pot theory and his treatment of main and side contradictions, and an excellent interview Sartre gave to Michel-Antoine Burnier in 1973, an interview that was published in several journals. Obviously, individual rights had become more important to Sartre in the years of 1972/73. Of particular importance was the treatment of gays to which Sartre attributed the role of a litmus test for a free society. Sartre supported their demand for equal rights as one of the very few and certainly the most prominent heterosexual intellectual precisely because he had no common interest with them. In a next step, Sartre advocated individual rights even for his political adversaries. The first major case was the one of the notary at Bruay-en-Artois in 1972. This person was accused of having killed a girl. The Gauche Prolétarienne called for the lynching of the notary. Foucault demanded a tribunal of popular justice, a concept Sartre had supported just one year earlier in a case against the French Police. However, Sartre asked now the case to be brought to the attention of the (bourgeois) courts and that the judges should decide. Sartre had become a proponent of rule of law. The most famous case of engagement in favor of his political adversaries was the one of the boat people in 1979 when he demanded together with Aron that the state intervenes on behalf of them. He supported those against whom he had fought ten years earlier. It is telling that in the same year, in 1979, he mentioned in two interviews with Clément and Macciocchi his new version of humanism. In the interview with Clément, he clearly recognized his change of opinion—he who had been against humanism in Nausea, then declared existentialism to be a humanism and thought in his Marxist time that it was better not talk about humanism. Only for a reader who was not aware of this development, it could be astonishing to read in Hope Now: “I think that the total, truly conceivable experience will exist, when the goal that all men have within them – the Man – is achieved”, where the expression “the Man” (l’Homme) starts with a capital letter. His support for individual rights had an immediate impact on Sartre’s concept of violence. We all remember his unlimited support to violence in favor of the oppressed in the foreword to Frantz Fanons The Wretched of the Earth 1961. Similar statements followed. Arguing along the same line he could state in an interview published in German in 1970 that the killing and abduction of German ambassadors in Latin America was justified. This “unspectacular” statement get its importance from the fact that, when Sartre was asked the same question by journalists of the German journal Der Spiegel in 1973/74, he answered that such acts would not be justified anymore. Obviously, Sartre had reverted his position by almost 180°. In 1974, just ahead of his visit with Andreas Baader, a leader of the German terrorist group RAF, he even called the killing of the president of a court in Berlin “a crime”. There had obviously been quite a big change with Sartre in respect of his attitude to violence since 1970/71. He confirmed this position in the interview with Macciocchi in 1979. It became clear that Sartre retook the same position he had already taken between 1945 and 1953: violence has to be evaluated in the framework of means and ends. There is no unlimited support for violence any longer. In the contrary, he clearly spoke out against the Marxist thesis of “violence as the midwife of history”. Sartre and the anarchist model of society. Sartre never was a second Thoreau calling for going back to the woods. Already in Being and Nothingness, man was conceived a social animal, however dysfunctional these relationships were. This aspect of man as a social animal became more important as time went by. We all know about Sartre’s implicit praise of the group in the Critique. In such small anarchist communities, Sartre obviously saw the concretization of the group praxis he had analyzed twenty years earlier in the Critique. The specific new development of the seventies was that Sartre moved away from a concept of groups focused on the workplace to a more generalized concept of groups. In the 1950s and 1960s, Sartre had praised anarcho-syndicalism—e.g. in Communists and Peace in 1954 and the Critique 1960. In the first half of the 1970s, he supported the movement for workers’ self-management—Lip in Besançon, in Portugal after the Carnation Revolution. Whereas in both cases the focus was on the workplace, Sartre defined an ideal life in groups in 1979 in such a way that it could include also groups based on residence or political affinity, or even religion or sexual preference. Sartre’s ideal of living in groups had definitely become less Marxist and more anarchist. In Hope Now (1980), Sartre stated that life in such groups would be based on fraternity. In his new political philosophy, fraternity replaced the Marxist concepts of production and base as the primary relationship between men. He defined fraternity as an affective, practical relationship of the kind brothers and sisters have in a family. The members of a group would have “a common origin and, in the future, a common end”. Here we can find the double aspect of the formation of the subject as Sartre had devised it in Search for a Method or the Flaubert. The common origin stands for the common situation in which the constitution of the subject takes place, and the common end stands for the common fundamental choice in the process of personalization of the subject. This second half of the definition makes clear that Sartre did not have in mind actual brothers or sisters or, to speak with the terms the British sociologist and political scientist Paul Hirst used in his book Associative Democracy (1993), that Sartre was not thinking of communities of fate like (at least the early) communitarians did, but of communities of choice. People congregate in communities as they like and they can leave them whenever they want. At least for an adult we can say that the family is not a unit one is born into, but a unit one has chosen to live in. In this regard, Sartre’s ideas of such communities are close to those of Seyla Benhabib’s and her three criteria of a pluralistic, cosmopolitan society. According to the interviews he gave to Clément and Fornet-Betancourt in 1979, the life in such groups would ideally lead to complete transparency in intersubjective relationships. By transparency, he meant complete, conscious knowledge about the thinking and acting of the other human being. Full transparency would go together with love and complete congruence with respect to political or professional ideas. Intersubjective transparency became to the later Sartre what subjective authenticity was for the Sartre of Being and Nothingness. That Sartre indeed had become an anarchist can best be shown by his increased animosity against state, politics, and politicians. We all know about Sartre’s life- long and intense antipathy towards the state, politics and particularly politicians. In an interview with Leo Fretz in 1976, he announced a joint book project with Benny Lévy under the title “Pouvoir et liberté”, “Power and liberty”. Its core idea was made public in an interview he gave to the Italian very left-wing publication Lotta Continua in 1977: Libertà e potere non vanno in copia: liberty and power do not go together. Here, Sartre uses still power in its very broad and Marxist meaning as political, economic, as well as cultural power. A significant change in his notion of power took place in 1978 when he clearly met the focus on state power. In the interview he gave to Goytisolo, he said that man will not be free, “if governments do not cease to exist in their current form und the form of the state itself will be destroyed.” He repeated this idea in very similar words in interviews with Neudeck and Fornet-Betancourt in 1979. There cannot be any doubt now. Sartre not only considered himself an anarchist, he was an anarchist. However, Sartre did not call for the immediate full destruction of the state. Because of scarcity, the state cannot be fully abolished in our time. As he said in his interview with Fornet-Betancourt in 1979, for an interim period we would still need a state including army, police, and law. The one who thinks that this is nothing else than the old Marxist concept of a two- stage development from the realm of necessity to the realm of freedom, from capitalism to communism via socialism, is mistaken. Unlike in the Marxist concept, the first stage is not connected to the dictatorship of the proletariat or the communist party. Here we can again recognize the main difference between anarchists and Marxists. for the French Republic and according to Simone Debout this draft was heavily influenced by Proudhon. What Sartre aimed for towards the end of life was a federal and at the same time transnational state. It was a concept of state that clearly opposes the idea of the modern nation state that is so characteristic for Europe. Sartre’s ideal state would have a clear federalist structure. Correspondingly, Sartre supported regionalist movements until the very end of his life. The small communities he spoke of in the interviews with Neudeck and Fornet- Betancourt would organize themselves in states based on a system of direct democracy. This would also include a system of imperative mandates, a theme Sartre had discussed already in earlier interviews from 1970 to 1973. However, groups would not be organized only according to workplaces as this would have happened in an anarcho-syndicalist society. The system of direct democracy and imperative mandate would rather include many different types of communities. As important as the federal structure of the state would have been its transnational character. Similar to the time when he was involved in the foundation of the Rassemblement Démocratique Révolutionnaire in 1947/48, Sartre strived for a true European Union—not one that was under an American-German dictate, but one that was truly transnational. Like-minded proponents he found in 1978/79 in the Partito Radicale in Italy under its leader Marco Panella. This was a party in favor of women and gay rights, divorce and abortion, the liberalization of prostitution and soft drugs. It was a party that indeed transformed itself in 1989 into a transnational party, the Partito Radicale Transnazionale. Sartre’s contacts to this party run mainly via Macciocchi and the writer Sciascia. With his ideas of a true federalist and transnational state, Sartre’s idea anticipated those of Freddy Heineken who fought for his project of Eurotopia, a United States of Europe consisting of regions. It was a project heavily influenced by the philosophical anarchist Leopold Kohr—with direct democracy and particularly grassroots democracy as differentia specifica of the Sartrean version. Sartre could not finish his anarchist political philosophy. He run out of time. Moreover, interviews are not an ideal instrument for systematically developing a new philosophy. However, there are enough fragments that we can definitely state a change from Marxism to anarchism in Sartre’s political philosophy of the 1970s and there are enough fragments that allow us to ask the question of today’s relevance of Sartre’s anarchist political philosophy. The biggest challenge to today’s democracy is populism. It is mainly right-wing populism, but in Southern and partly Eastern Europe, there is also a strong current of left-wing populism. The roots of populism can be found in the diversity of our societies. Today’s major contradiction in politics is obviously not anymore the one between left and right, but the one between top and bottom. The discrepancies between the relatively homogenous elites and part of the masses are steadily growing. There is disagreement on fundamental questions from weapons and social or health insurance to immigration and refugees. And there is no compromise in sight. Denying this diversity in society as the early communitarians tried, will not solve the problem. There are only two possible ways to go. Either the majority forces the minority to live according to their rules or we have some kind of anarchy. Even if we shaped our democracy according to the proposals by Rawls in his Theory of Justice or by Habermas with his model of a deliberative democracy, our democracies would be based on oppression. Of course, it would be a moderate form of oppression, but oppression nevertheless. Sartre always stood up against any kind of oppression. Merleau-Ponty correctly stated about Sartre in Adventures of the Dialectic in 1955 that Sartre was more interested in the fight against oppression instead of the fight against exploitation and by that was more an anarchist than a Marxist. It was because of his aversion against oppression that Sartre opposed any form of a state in which a majority oppresses a minority. Therefore, he opted for a model of anarchy where each community decides by itself how to live. Finally, everybody has the right to live according to his or her own values. Since Sartre’s anarchist model is the only one to eliminate oppression as much as possible, it is the only adequate answer to avoid the potential conflicts caused by the growing diversity of our societies. As Sartre said, a state will still be needed. Scarcity and the other two factors mentioned in the Critique that limit our freedom and cause alienation—counter- finalities and exigencies—will limit the application of anarchist principles, particularly in the economic field or, to use a Marxist term, in the base. However, in the superstructure, there would be many possibilities to apply anarchist principles to reduce the number as well as the intensity of the conflicts in our societies. Why not allowing on a very local level different answers to issues such as weapons, abortion, gay marriage, immigration, refugees or social and health insurance? Why one size fits all? Why not allowing Staten Island an attitude towards weapons different from the one Manhattan takes? 11/16/2018 11/16/2018 SqueeComments are off for this post.